August, other than meaning another complete trip around the sun for your humble correspondent, is no stranger to incredible feats of Mother Nature’s fury. We’re at the finish line of meteorological summer (June-August), and some of the first signs of fall begin showing their cards. As with all transitions of seasons, much like throwing a match into a fireworks factory, the atmosphere can have explosive results. 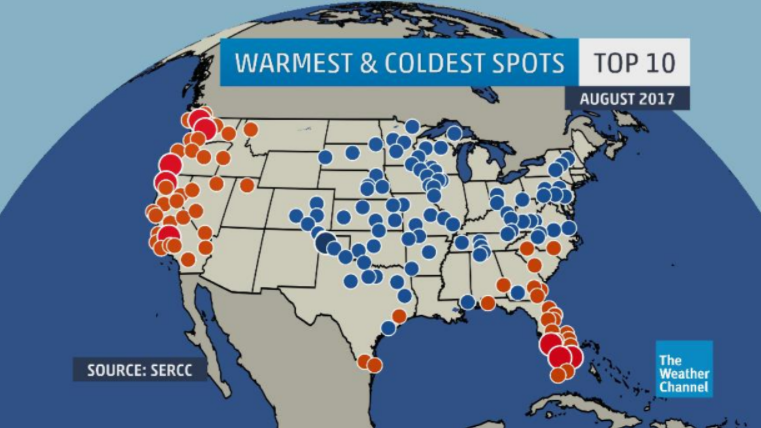 Across the US, temperature extremes of both kinds can make an appearance. Some of the season’s first powerful cold fronts often arrive with that all familiar crisp, cool, dare-I-say autumn-like feeling. On the contrary, static weather can bake regions with oppressive heat, giving rise to the icky-sticky dog days of summer. The pedal is pressed all the way to the floor as the tropics begin their ascent into peak season. It only takes one land-falling system in the US to bring widespread extremes to a region. Yes, it’s even possible to see snow towards the end of the month – there are even a handful of places where it can be a downright common occurrence. So what did this August have in store for us? Let’s find out. Located in the heart of Washington’s apple growing region is the town of Yakima. This month, Yakima topped the list of warmest spots in the country at seven degrees above average. 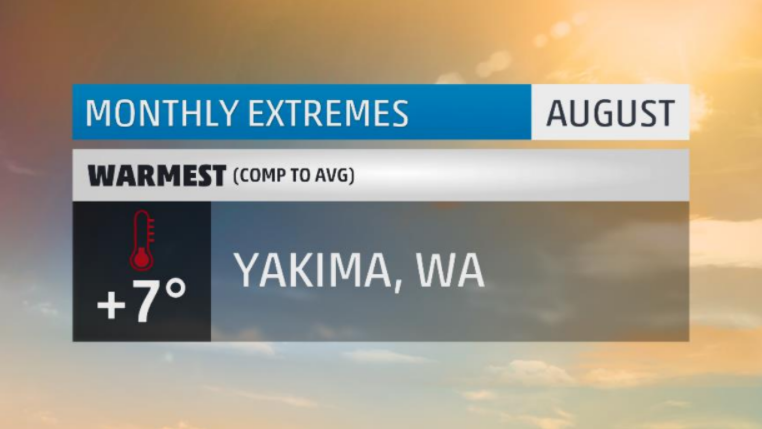 This was Yakima’s warmest August on record and 5th warmest of all calendar months. Of August’s 31 days, 28 were above average and 11 of those were at least 10 degrees above. Twenty-three days were at least 90 degrees including nine 100-degree-plus days. The month began with twelve straight 90-degree-plus days concluding an impressive 22 day heatwave going back to mid-July. That’s long enough to be the town’s 2nd longest heatwave on record. Amidst the heat, two daily high temperature records were broken. To top it off, this was Yakima’s 6th straight month with above average temperatures. With the start of the apple harvest season just around the corner, a couple gallons of fresh, cold cider might be just what the doctor ordered to beat the heat. For the 4th straight month in a row, the West has been dealing with unruly heat. Persistent and strong ridges across the West have allowed the heat to build and build. 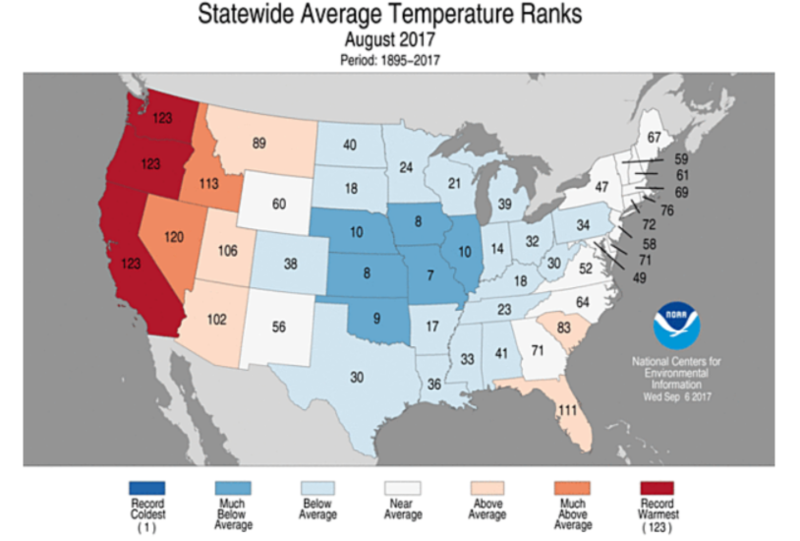 Los Angeles, Seattle, Medford, Bakersfield, San Francisco, and Salt Lake City all had a top ten warmest August. Elsewhere, the last bastion of heat in the US was delegated to Florida. As those previously mentioned season-changing cold fronts bring heat relief to millions across the northern-tier, they rarely pass through Florida during the summer. As a result, much like in the West, air stagnates and allows for long stretches of miserably hot weather. Congratulation goes to Miami where they just had their warmest August on record. We would’ve sent balloons, but it was just too darn hot. Thirty minutes southwest of Kansas City is the town of Olathe, Kansas. What is typically a place that sizzles under the August sun; folks in Olathe had temperatures more in common with a typical New England summer. 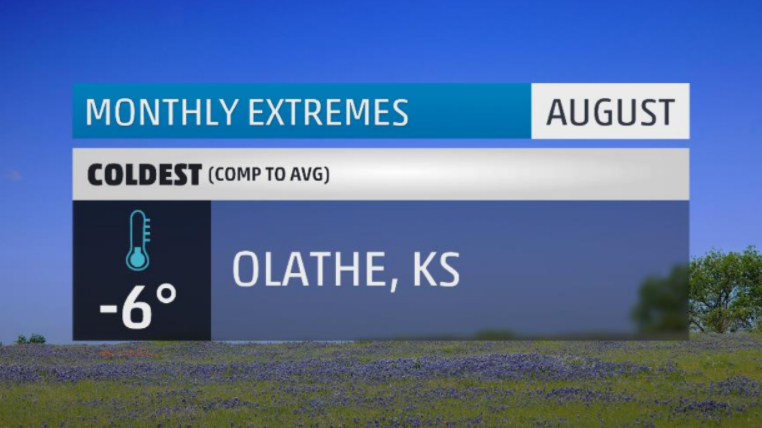 This was Olathe’s coldest August and 4th coldest summer month on record. All but 2 days this month were below average with 4 of those days at least ten degrees below average. In a typical August, Olathe will experience 12 or so 90-degree days. This August was eleven shy of the mark! Twenty-three days had highs below 85 degrees, eleven were below 80 degrees, and one day failed to reach 70. On their chilliest day of the month the temperature topped out at just 65 degrees. This set a new record for all-time coldest August day on record in Olathe. Throughout the month, another 10 daily cold high temperature records would be set. Best take that BBQ inside; don’t want it to get cold. The epicenter of cold this month was situated right in the heartland. Illinois, Iowa, Missouri, Nebraska, Kansas, and Oklahoma all had a top 10 coldest August on record. The cooler weather, while being a welcome event for most, could mean shaky times for farmers. The early fall preview could stunt crop growth, leading to a late maturity and even later harvest date. Which crops could be affected and what the bottom line will be still remains to be seen. Not just the wettest August on record by a bit, but crushing the old record by 37 inches! You would need to combine the second, third, fourth, and fifth wettest Augusts just to top this month. This wasn’t unprecedented for August standards. 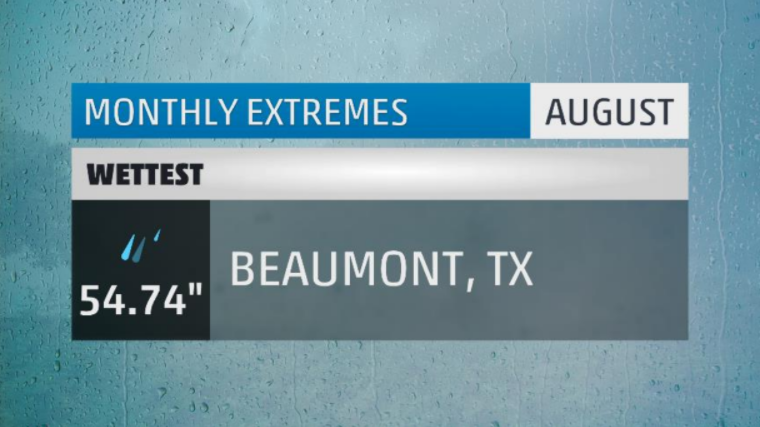 This August surpassed the wettest month in Beaumont record by 32 inches! You would need to combine the second, third, and fourth wettest months to top this month. Most heavy rain events are enough to give a place one spot in their top ten rainiest days in a month. For Beaumont, this August brought them three including the top spot. Two of the previously mentioned three days were enough to break the top 10 wettest for any day in Beaumont history. That includes a new record for the wettest day on record. You would need to combine the second, third, and fourth wettest days in Beaumont history to top the new number one. The top spot here belongs to another Texas town, Albany, which received 29.05 inches in one day in August 1978 as the remnants of Amelia sat overhead. 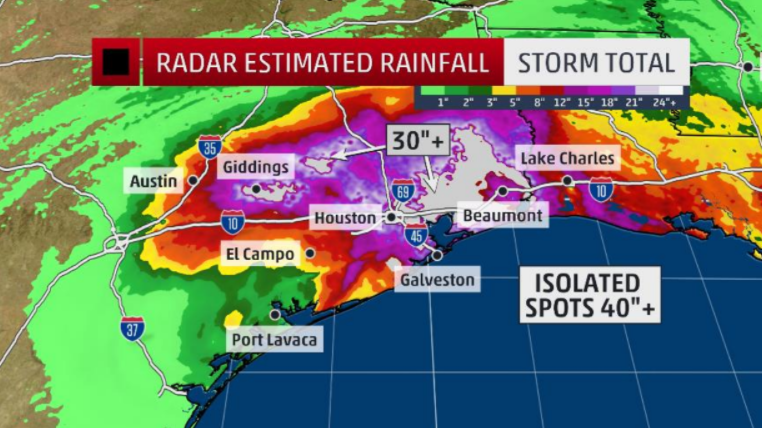 Any way you slice it, the incredible rainfall in Beaumont lead to a laundry list of problems. Hundreds of thousands of people were forced to leave their homes due to rising waters. Over 70 local rivers, creeks, and streams flooded over their banks; many of which reached all-time record height. Power, communication, water, and travel systems were disrupted or stopped altogether. It will likely take years for some of the smaller communities, not just around Beaumont, but across Texas, to fully recover from Harvey’s devastation. Ten official observations stations had their wettest August in-and-around coastal Texas. Another fifteen in the area would crack the top ten. 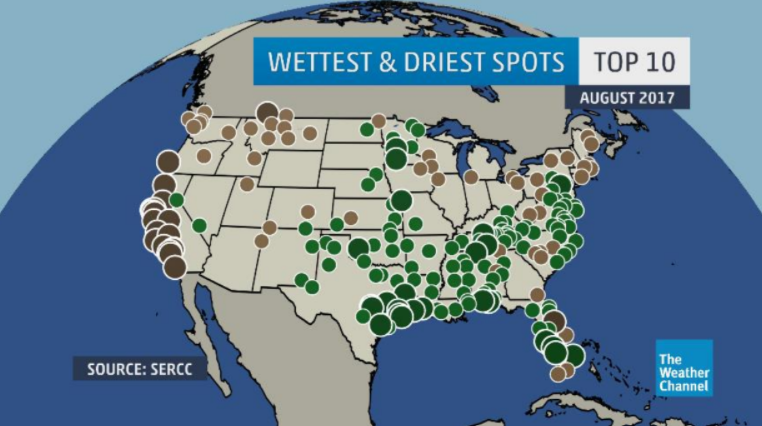 Other notable wet spots include: coastal Florida and the mid-Atlantic. Elsewhere, where the heat had built in the West, very dry weather has followed. Okay, I cheated here a little bit. Normally, I exclude Hawaii and Alaska in my summaries and instead focus on extreme weather across the lower 48. But being that some snow actually showed up in the observation network this month, I’ve decided to break the rules. What? They’re my rules. I’ll break them if I want to! If Mr. Potato Head was heading home to Idaho in August, hopefully he remembered to pack his sunglasses accessory. 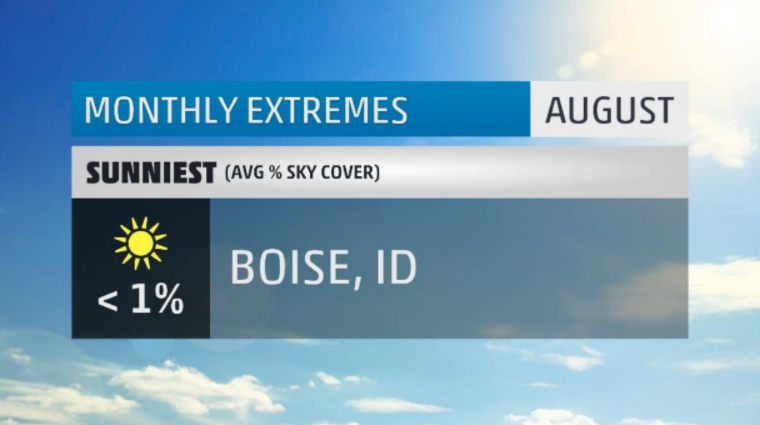 The sun was shining bright and plenty over Boise where they ended the month averaging less than 1% total cloud coverage. Twenty-seven days were completely cloud free while the remaining 4 had fewer than 20% cloud cover. Ample sunshine led to ample heating as the potatoes baked to 3 degrees above average for the month. However, climatologically speaking, August is right on cue for their sunniest time of year. 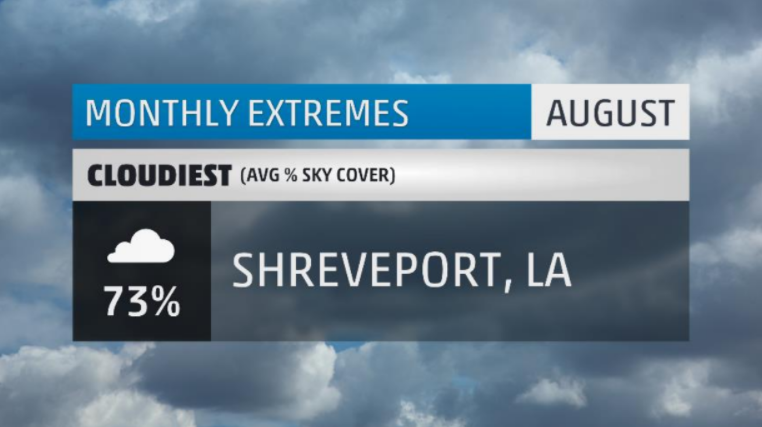 Then there’s Shreveport, where folks there couldn’t escape the clouds all month. The 73% total average cloud coverage was due in part to an active weather pattern that brought twenty days of rain to the city in August. Of those days, all twenty had at least 50% total cloud cover while 18 of those were at least mostly cloudy to overcast. The rainy stretch accounted for over seven inches of rain for the month; that’s almost five inches above average. Shreveport’s cloudiest month of the year tends to be February, but we are a long ways from there. Cloud cover from Hurricane Harvey kept the city under overcast skies for the final few days of the month. 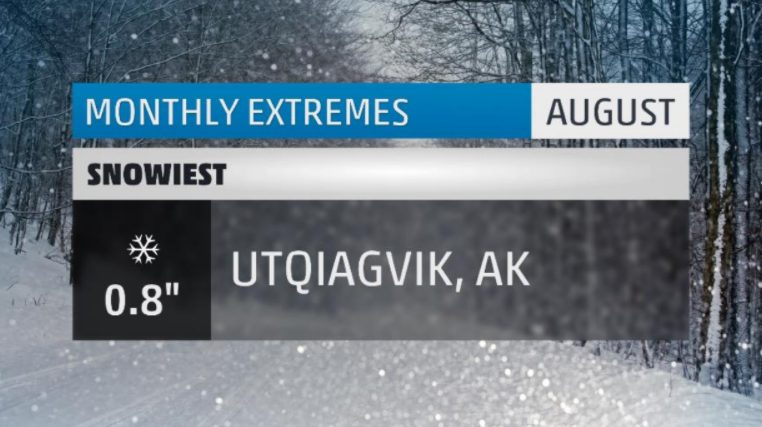 There you have it, the extremes for the month that was August 2017. Make sure to check back next month to see what September has in store. What weather extremes did you face in August? Let me know in the comments below. I live in a very dry area of California. The only weather ‘extreme’ here in Baton Rouge… Extremely Lucky… to have been missed by both Harvey & Irma!